Nintendo's 3DS game system debuted at stores everywhere Sunday, letting gamers pounce on the world's first 3D handheld that doesn't require goofy glasses. 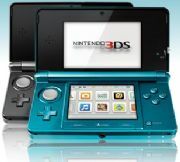 Early reports suggest the launch of Nintendo's $250 3DS games system is off to a hitch-free start. A few retailers like Best Buy and GameStop even opened at midnight, allowing fans to get their 3D gaming fix early. Here's a brief roundup of buzz, news, and reports from the front lines. At nearly a dozen Best Buy stores around the country, 3DS previews started at 10 p.m. with sales beginning at 12:01 a.m. Lines for the 3DS snaked around the block at San Francisco's Powell Street GameStop. IDG's own GamePro.com says about 50 people were waiting in line for the store to open a minute past midnight. GamePro.com reported the first person in line, 21-year-old Kyle Tillisch, had been waiting since 9:30 p.m. Other North American retailers offering midnight launch events included Best Buy, and in Canada, tech retailer Future Shop. On Twitter, many gamers reporter huge lines at places like Best Buy's Union Square store in New York City, where Nintendo held an official launch event. One person who presumably waited in line at Union Square, Ashtondo, tweeted: "Nintendo is going all out. Free food, music and entertainment for everyone waiting in line to buy a 3DS." There were reportedly no lines for the Nintendo 3DS system in other parts of the U.S. Twitter user UFLinguist wrote: "Swung by Best Buy. 90min to launch and not a soul in line? Did I misinterpret how popular the 3DS is gonna be?" Another Twitter user, Mr_Zanzabar, who identifies himself as from Arizona, wrote: "Boohaha! No line for me to get my #3ds ..."
While some retailers drummed up excitement for their Nintendo 3DS launch with midnight sales, others such as Walmart decided to appeal those looking to save a nickel. * Nintendo DS trade-in systems must include AC power adapters. * Walmart is offering trade-in deals only at participating stores in: Alabama, Arkansas, Florida, Georgia, Kentucky, Missouri, Mississippi, Oklahoma, North Carolina, Tennessee, Texas, and South Carolina. Toys R Us is offering free shipping on online orders of 3DS game systems along with deals on 3DS games ( buy one get the second game title half price). For a complete list of Nintendo 3DS deals read Game On's Matt Peckham recent post where he outlines deals from Kmart, Amazon, Target, and more. Image Credit: GamePro.com: Kyle Tillisch (third from left) was the first to purchase a 3DS, arriving to wait in line just at 9:30 p.m.
As of this writing, the Nintendo 3DS launch appears to be going smoothly. Unlike Nintendo's late February launch of the 3D system in Japan, where it sold out quickly, there are no reports (so far) of retailers selling out here in the U.S.
Online retailer Amazon, which was offering a $25 credit on pre-orders of the 3DS game system, currently reports the game system "in stock." Last week Amazon's U.K. storefront said the Nintendo 3DS had broken its record for console pre-orders, beating previous pre-order record-holder, the Nintendo Wii. fusionplank23: I can't wait to get my Nintendo 3DS after church; I'm still amazed that I'm actually picking it up upon launch day! jterleski: Sick. But that's not stopping me from waiting for my #3DS in the Fry's parking lot. Asrialys: Whoo! Second #3DS at Target. Could have been first, but I looked at other things. jonnypile: Marvelling at a 3D picture I took this morning. It's amazing - looks like you can reach into the screen and touch it. TheRegMan: Forests and dragons are appearing on my table. adamtweetsalot: 3DS is out today. I'm opting for a cheaper solution - shrooms and regular DS. EchoInTheNight: Oh my god! The augmented reality on the Nintendo #3DS is pure epicness! i love fighting the dragons it looks so sick!